I’m fixing up the little studio we have above our garage for its multipurpose use and in my quest of inexpensive furniture of course I shopped IKEA. A few weeks ago I bought an Ektorp loveseat and I also had a Hemnes coffee table sitting in the garage, plain and white and perfectly fine on its own, but I wanted to hack it into something more unique. I decided to add a wood top to the surface which I then stained a weathered gray for rustic meets coastal look. 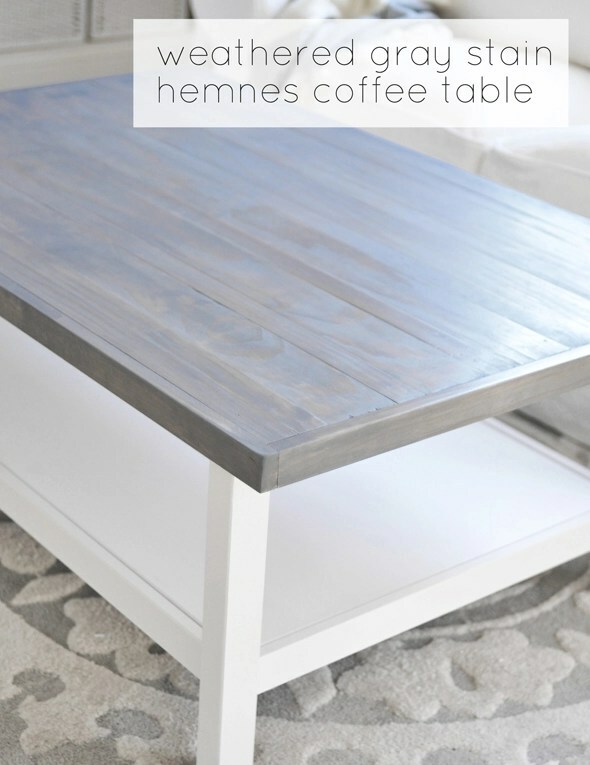 If you’d like to recreate this project, these are the supplies you’ll need: Hemnes coffee table, six 8 foot pieces of 1 x 2” and three 1 x 4” pieces of wood, stain of choice, polyurethane, sponge chip brushes, brad nailer, miter saw, wood glue, orbital sander. Apply a good amount of wood glue to each piece then flip them over. You can secure the wood to the table with wood screws underneath but we opted to secure the wood with a brad nailer above for quicker application. Since I was going for the rustic look I didn’t mind if there were teensy tiny nails exposed on the surface, and since the stain I choose was gray they virtually disappeared. Sand any imperfect edges before securing the wood surround. We chose a square edge for speed which I later sanded but you can cut the edges at a 45° angle in the corner if you prefer. All pieces were secured with 1 ¼” brad nails, then I rounded the edges with the orbital sander so they were less sharp. I used two coats of the same stain I used on this planter bench but if you want to buy it note it’s been rebranded under the RustOleum label in the same weathered gray shade. I have not added a protective coat yet but I don’t want it to be shiny so I’m going to use either a clear paste wax or this matte polyurethane to preserve the rustic weathered look of the wood. The addition of the wood top adds a rustic and unique touch, and the project costs less than $200 including the table, wood, and supplies. Happy hacking! Love this quick Ikea Hack! I think the gray and white combination looks great, but I agree other color combinations are just begging to be made. What a great idea. I love the grey and the whole look! Such a cute idea. My boyfriend just recently turned a butler’s table into a coffee table. You can check it out at my blog. He and I love bringing old pieces back to life again. p.s. where is your rug from?? Here’s the link to the rug Ashley, it looks gray on the site but it’s a pale blue gray. This is awesome Kate! That stain is spot on and absolutely beautiful. What a great idea! I love the stain, and the different width planks. Gorgeous, Kate! Love this! I have the black table and have been pondering how to change the look. I painted the top to a lighter color but love this wood project much more. I need to add it to my list! Hi Sandra, great question. Ordinarily I use wood conditioner, this particular brand says it’s not necessary. I recommend reading the label, many stains are now water based and the wood conditioner on the label says it’s not to be used with water based stains. This gray was an oil based stain, so it could have been used but I didn’t this time. I love how this turned out! I wonder how this stain would look on my butcher block kitchen counter tops? Thanks Kate! I’ll be sure to check the label! So simple but beautiful! Love the peaceful color palette in this room! Can’t wait to see the full reveal =). Beautiful Kate! The whole room is gorgeous. It has such a calm and peaceful feel to it. Love the photo of your sweet kitty. Looks like Coco? is enjoying the studio, too. Wow, what a beautiful table! I have ikea furniture that I’m currently trying to make ‘cute’ furniture out of…this is inspiring. If it’s okay with you, I’d like to feature your post on my blog? Thank you for sharing! Great hack – so simple but big impact. Looks a lot higher end than it is and fits your rustic coastal aesthetic perfectly! Just a quick note. I have a case of the Rustoleum stain from H4H. LOVE it. It stains wax well, too. Made an excellent griege (brown + gray) wax. But. Where I’m going with this, if you rub polyacrylic into your piece with a cloth, it seals it and doesn’t make it shiny. It also doesn’t yellow, as you probably know. I have always been partial to the Hemenes pieces. Something about their lines really speak to me. You have done a beautiful job, as usual. Love it Kate! It is perfectly weathered and such a great Ikea hack. I actually saw this earlier on Pinterest and pinned it not paying attention that it was your amazing work. Should have known! I love this idea to take a standard ikea table and rough it up a little. I currently have a coffee table I would love to replace and this just might be the thing I need to make it work. Amazing idea! This is awesome!!! I love rustic meets coastal and these colors are awesome together! Beautiful living room! Great job! I love the calm, serene look of this room too. Love this. I’m making a “when IKEA opens” folder on Pinterest because one is opening in my area later this year. I went to the link for the rug but they look gray. In your picture I see colors of blue also. Is that just a reflection or is it as depicted in your photo? Beautiful table! Your post was perfect timing as I have a coffee table I got from freecycle that I just finished yesterday – white base with darker stained top! I also used glaze in the nooks and crannies. I just have to seal it now. I love your blog! Thanks for the inspiration! Not much of a do-it-yourselfer but love the project, and every picture of the room is inspirational. However, my 3 kitties think you should have featured more than one pic of their “cousin”. Ha Ha! Great project. I’m thinking of doing something similar to my old breakfast bar counter. One question… Did you patch the nail holes or just leave them? Thanks for sharing. Hi Donna, I didn’t patch them, they’re very very small since they are brad nails, they virtually disappear next to the gray stain. Kate I love the table. I have used the polyurethane that you are going to use on my kitchen table and I love it. I would love to try the idea on end tables that I bought at World Market years ago, but I am not sure of the wood type, so I am a little intimidated by it (afraid to sand and then find something that will be harder to fix.) I am thinking it is mango wood, but not 100% on that. Can you suggest a way to detemine the wood type.. maybe a test on the underside of the table? By the way I love the kitty in you picture. Thanks! Had no clue that there was a wood stain in ‘weathered grey’. My wife wants a kitchen table top to look like, well, weathered fence boards, when it turns that silvery grey. Here I was thinking I was going to have to rummage around for old fence boards. Great idea and the perfect addition to a beautiful room! Where are the curtains from?? Those are my design Jessica, pattern is available next week! Haven’t looked at your site in awhile, but this table caught my attention. When I remodel / reorganize my living room, I’ll eventually need a new coffee table too. This one looks like it just might be the kind of table I’m looking to “re-purpose.” I noticed that in the original top photo, there is some type of white bottom shelf on the table. The photo that shows the wood boards being glued to the table top show the white bottom shelf not there. Was this bottom shelf something you added later or did it come with the table? I just got a 2014 IKEA catalog, so I’ll have to take a look at the different coffee tables they have. Your “re-purposed” table came out beautiful!! :) Great job!! Wow! The table looks stunning. One of the great DIY around. I just love the blamish shade of coffee table, it is looking so seductive! Just like my pop art paintings! Beautiful work on the table! I have a question for you. Do you have any sugggestions for how to achieve a limed oak finish? I am inheriting a round dining room table from my grandmother that has an oak with a painted white base. I would love to sand it down and use this weathered grey finish or a limed oak finish if that is even possible! Any advice would be much appreciated! Thanks in advance. This is awesome. I want to do this to my ugly cheap dining room table. Any advice? Wonderful Kate but i like it when you redo thrift store finds. Well that needs some real efforts but worth every single second spent :) beautiful! Love this and the whole room. So beautiful and calming. Such a lovely palate. I was wondering how this worked with your studio up there also? Where is that in relation to this? Thanks can’t wait to know! What a great hack. I have been looking for a coffee table. And all the ones I like are way too much for my budget currently. I am going to be sending this to my husband. I love it. Going to buy a hemnes table tomorrow. Could you tell me what kind of wood and what brand and color of stain you used? Thank you very much! Woah, I lo-lo-love the table! I’ll ask the hubby to make us one, too. Love the look and it would be perfect in our new living room. Wow, this is beautiful! Thanks for breaking down the steps! Question for you… Lowes has precut wood planks labelled “craft wood.” They happen to be the perfect size for a similar project I am working on. Yes, they are slightly more expensive but they appeal to the efficient (lazy) person is me. The boards are thinner though than 1 inch. I like the size…I don’t want to add more height to the coffee table than I need to. And they are very smooth. Any reason to be concerned that I am using this type of wood? Hi Claudine, it depends on the softness of the wood, sometimes hobby boards are less durable but you’re not opposed to the occasional ding from daily wear & tear, go for it! Does the weathered grey look to have a little bit of a bluish tint to it? my dad is building me something and i love that stain and was thinking about getting it. but question.. did you have to use any white stain or paint with the gray. your link about the rebrand sent it to a white color not gray, so i was just curious. I just used two coats of the Weathered Grey nothing else!